Nazraeli Press, Portland, 2008. 140 pp., 76 illustrations., 13x16". Born in Nagoya, Japan in 1964, Yuichi Hibi trained as an actor and filmmaker, achieving success in a broad range of film and theater productions before moving to New York in 1988. 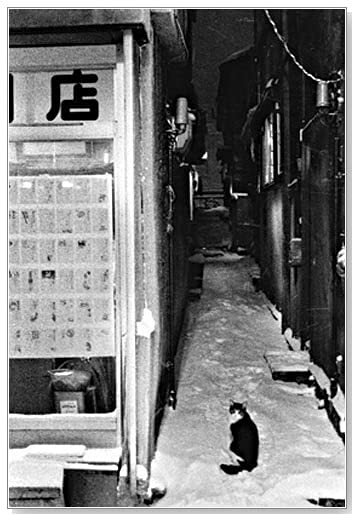 It was at this time that he began to make photographs. Speaking virtually no English, Hibi was the quintessential outsider. His quietly intense images evoke a sense of longing and isolation, yet they also find beauty and order and meaning in overlooked places and things. Hibi’s first monograph, Imprint, was published by Nazraeli Press in 2005 to wide critical acclaim. 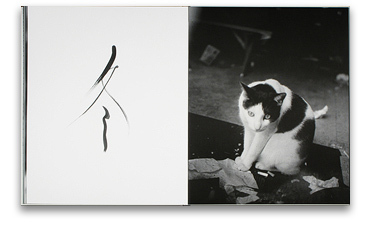 We are pleased to announce the artist’s follow-up monograph, Neco (“Cat”). Spanning several years, the rich, grainy photographs of cats at rest, play, and on the hunt spill off the pages in this beautifully-produced artist’s book. Rather than simply documenting the activities of cats he has come across over the years, Hibi has managed to capture the very essence of being feline. Neco is printed in an oversized format on lush Japanese uncoated paper. This first edition is limited to 500 numbered and signed copies. A special edition with original print is also available.